Like all good things on this earth, the bluegrass hip-hop act Gangstagrass, started out as a simple concept.. Solid lines of traditional lyrics and street poetry delivered over real roots music. At the center of Gangastagrass is celebrated the country songwriter Rench who is flanked by capable, multi-genre players who can set just about any room on fire. The power that results on stage from the injection of hip-hop can be inspired. And the instrumentation and use of classic strings is the perfect foil, acting as far more than just a backdrop. (Just Watch This Video.) 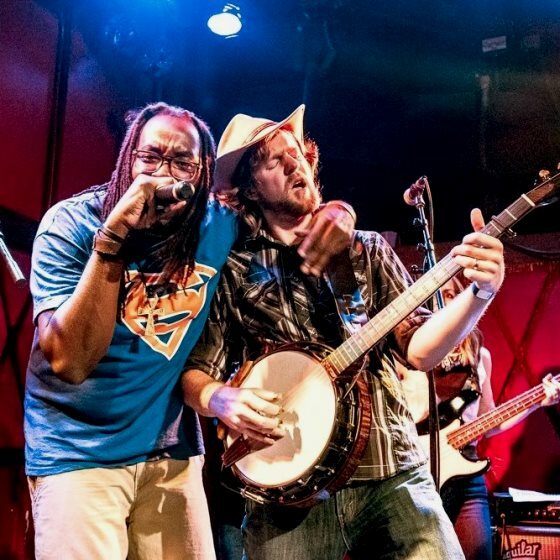 Gangstagrass is an audio experience, a sight to behold - and definitely something to remember. And they are coming to Boston this weekend. A country core act with hip-hop elements is a tough sell for a lot of folks, but their breakout hit "Long Hard Times to Come," the Emmy-nominated theme to the FX television network's song Justified, smoothed over a number of edges. The commercial success of that song aside, a music lover just cannot help but get excited to think they are finding something joyous in music. On the band's Facebook, Rench writes that the act of the band bringing this sound to the world is akin to wrestling and "taming a mountain lion." Believe it. Editor's Note: country-minded folks should have a listen to Rench's new solo debut - Them's The Breaks.